Standing outside the clubhouse, waiting for Justin Masterson, his family wanted the scoop. Would Masterson be pitching again for the Red Sox? Where? He would, getting the ball on regular rest Friday in Cincinnati, about as close to his home turf (Beaver Creek, Ohio) as one could get. With Daisuke Matsuzaka not nearly ready to come off the disabled list, and Clay Buchholz working out some kinks in Triple A, Masterson has become as reliable as any Sox starter. But Masterson wasn't crediting himself yesterday. Instead, he turned to J.D. Drew, the fill-in No. 3 hitter who has mastered hitting and whose defense hasn't been too far behind. And it was Drew who just might have saved Masterson's performance yesterday, getting the rookie through the one inning in which he struggled with a spectacular warning-track catch. Plus there was Drew's solo home run to put the Red Sox ahead in the sixth, the team going on to win, 2-1, taking the series from the Mariners in front of 37,198 fans forced to sweat through a 2-hour, 46-minute game on a day in which the game-time temperature was 98 degrees. "I would imagine every time he takes the ball, the organization's got their chest out a little bit, which they should," manager Terry Francona said of his starter. "This isn't a fluke." Neither is the Red Sox' ability to win, despite the absences of David Ortiz, Matsuzaka, and Jacoby Ellsbury. Right now, the team's power, ace (by the numbers, at least), and speed are on the DL. That's tough to get through. But with the contributions from Masterson and Drew, not to mention Brandon Moss and Sean Casey, the Red Sox have remained on top of the American League East, having won eight of their last 10 games. Masterson walked the first two batters of the inning, then up came Richie Sexson. The Seattle first baseman, who is hitting just .206, smashed a sinker to the track in right. But Drew leaped to make the grab just in front of the Sox bullpen. Though Adrian Beltre tagged and went to third base, eventually scoring on Yuniesky Betancourt's fielder's choice, the inning could have been far worse had Sexson's bullet gone for extra bases. As it was, after a single to right by Jamie Burke, pitching coach John Farrell had to head to the mound for a meeting. But Masterson got Willie Bloomquist to ground out to end the inning. And after that, Masterson allowed just a walk in the fourth and a single in the fifth. 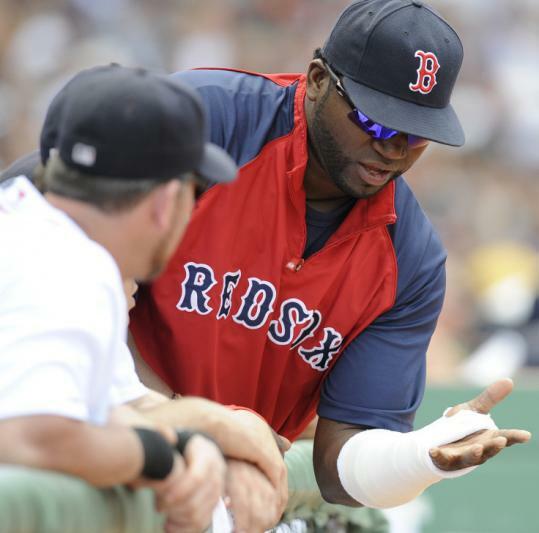 "He had to face a little adversity today where he hadn't had to face that before," catcher Jason Varitek said. "He didn't have a good feel early. He was misfiring and it was a bit frustrating for him. He couldn't quite lock it in, but he was able to stay in the game long enough to where the last three innings he was really able to find it and lock in." Masterson, though, knew whom to credit for his start. Not a bad idea to laud your teammates, especially after a catch like Drew's. "I'm as good as the defense, and they helped me out tremendously," Masterson said. "Richie Sexson is a big guy and he takes some hacks. I think it was supposed to be a sinker in and I think it kind of ended up being a little flat down the middle. He took a really hard swing. I actually kind of thought, 'Oh man, that's going to be a little far.' But I got it in enough for it to not go too far. "J.D. Drew then just made that great catch. If anything got me fired up, it was guys are behind you, they're just waiting for you to do your part." Which he did. He and Drew, who had the homer and also was hit by a pitch in the right wrist in the third inning with the bases loaded, earning an RBI. It was the second straight game in which Drew homered, and was his fourth in eight games, during which time he's batting .519 (14 for 27). But Drew wasn't the only hitter drawing praise. Dustin Pedroia got some too. An odd choice, perhaps, given Pedroia's struggles at the plate, a drought that now stands at 0 for 18. But Pedroia had at-bats, in the third and the fifth innings, that might just have allowed Drew to face Sean Green in the sixth instead of the lefty Bedard, Pedroia seeing 19 pitches (nine in the third, 10 in the fifth). And that, of course, helped the Sox win. Even a couple men down. "Well, certainly the timing has been just about perfect," Francona said of Drew's hot streak. "He's seeing the ball real well. "What you don't want to do is have guys try to do too much when you lose a big bat. Just try to keep a balanced batting order, and we still have that. Boy, he's giving us a big lift."